Polkadaisies Boutique Children's Clothing and Gifts: We are the Champions! 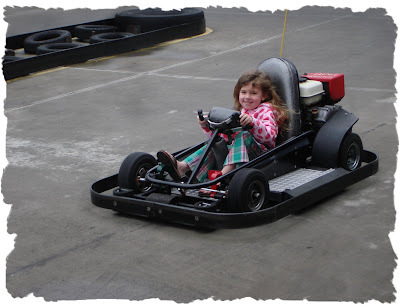 Everyone knows what a Daddy's girl Sadie is and that she would not normally pick me to do something with over her daddy, BUT when it comes to racing go carts, she knows who always wins...MOMMY! 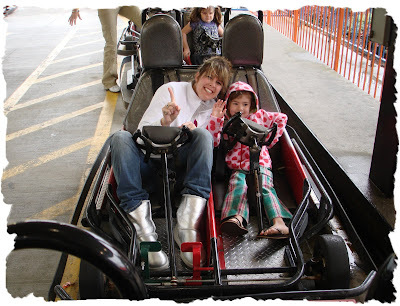 We went to Pigeon Forge Tuesday for a little fun and relaxation and go carts is usually on the agenda. 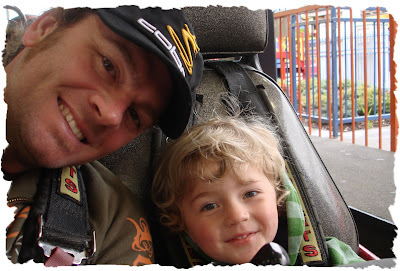 I almost laughed out loud when Sadie told her daddy that she was riding with me on the go carts. I didn't even turn and look at him because I knew he was disgusted and I wanted to enjoy the moment with a grin on my face staring out the window of the car. Sweet justification! I am sooooo competitive about some things and mainly with my husband. It just makes things funner. 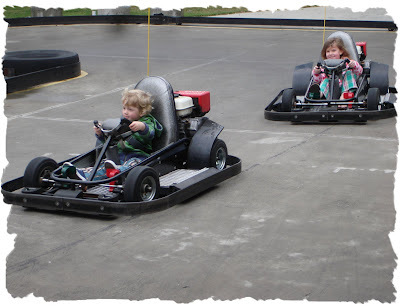 I always win when we race and it doesn't even matter if he starts out in the front or the back. I was behind him when they waved the flag to begin, and in front of him as we finished. How bad do I love beating him? I kept bumping a dad and little girl who was in my way until they so kindly moved aside. Sadie was even a bit scared at times, but I didn't ease up on the gas. I did however put my hand on her knee to comfort her. 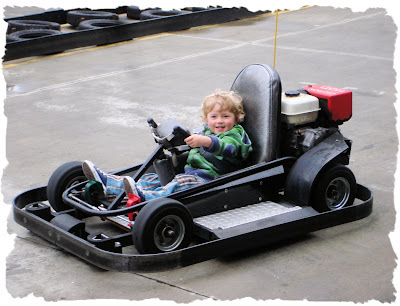 I'm not a horrible mom and safety was not an issue. I just wanted to win! 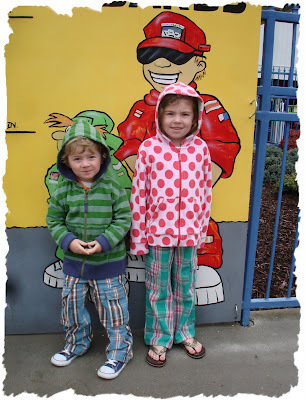 Sadie finally came around and was nothing but grins when she knew they couldn't catch us. Poor Gavin! He's stuck with his daddy until he figures things out for himself. For the record book...champs again!!!! Measuring up for round 2. 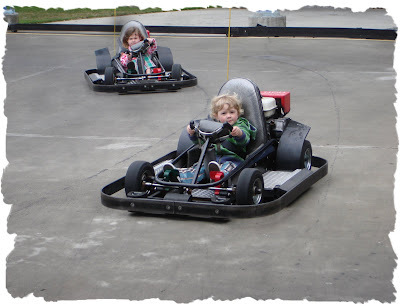 They had a junior track and the kids wanted to try it out. Age? It said 4-9 but they didn't question Gavin getting on who is only 2. I didn't know what to expect. I know he can drive a little John Deere tractor better than I can, but he had never done this before. I couldn't stop smiling watching him. He was so layed back and acted like he drives them all the time. They had a blast and so did Richard and I watching them. Best $6 we ever spent! Look at Sadie. She is so much like her mommy. She couldn't stand Gavin being in front. Yes, we are back at the candy store. 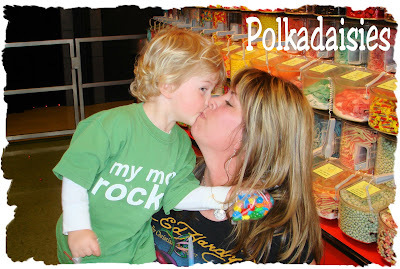 His shirt was inspiration for making my "mommy rocks" t-shirt that I will post later. What great pictures of you and your family!! !